The United States and Japan will remain the largest insurance markets in 2020, while China will rise to third place, according to a study by Munich Re. Munich ReÃ¢â‚¬â„¢s Insurance Market Outlook 2013 indicates that the global insurance market is set for strong growth in the years to come, with growth rates especially strong in emerging countries. As a result the global rankings of the largest primary insurance markets will change over time. While China was only in 15th place in 2000 in terms of total premium income, in 2010 it had already reached sixth place, and in 2020 is likely to be ranked as the third largest market. 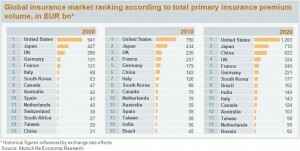 Brazil and India will also be in the top 10 in 2020. However, Munich Re does not expect the dominant position of the U.S. market, followed by Japan, to have changed by the end of the decade. Munich Re estimates that until 2020 the property-casualty insurance market as a whole will grow by approximately 50 percentÃ‚ compared with 2012 to Ã¢”š ¬1.85tn ($2.38tn), and the life insurance market by almost two-thirds to Ã¢”š ¬3.1tn. Growth in insurance and reinsurance in emerging countries will be significantly stronger than in industrialized countries. Nevertheless, the mature markets in North America, western Europe and the industrialized countries of the Asia/Pacific region remain the dominating growth force. These markets will account for a 73 percent share of primary insurance premiums by 2020, around 10 percentage points lower than in 2012. The share generated by the emerging countries in Asia will move up from 8 percent to 16 percent. Global insurance rates increased by 1.4 percent in the third quarter, unchanged from the second quarter, according to a quarterly market briefing just released by Marsh. Figures showing the typical renewal rate changes suggest that increases, although varying across lines of business, may be stabilizing, Marsh said. The Marsh Risk Management Global Insurance Index, a composite of changes in insurance costs over a rolling 12-month period, also showed that prices across major lines of insurance increased by 0.9 percent in the third quarter. Data on the U.S. market showed that for the second quarter in a row, U.S. companies were more likely to experience rate increases than decreases in major lines of insurance. — Although general liability rate increases accelerated in the third quarter, it is too soon to call it a trend. By contrast, workersÃ¢â‚¬â„¢ compensation rates stabilized. — The majority of property insureds experienced rate increases in the third quarter. However, the lack of a significant hurricane restricted insurersÃ¢â‚¬â„¢ efforts to increase rates. Check out I.I.I. information on industry results and market conditions.